The wireless Rockstick 2 Mouse is a sleek and stylish ambidextrous vertical mouse that comfortably cradles the hand. The Rockstick 2 allows for both right- and left-handed use, and helps alleviate tension and pressure in the arm and wrist by holding the hand in a neutral handshake position. Ambidextrous Mousing: The powerful Rockstick 2 Mouse allows users to alternate between right- and left-handed use throughout the day, reducing the risk of developing a repetitive strain injury (RSI). Comfortable Vertical Design: Regular mice can force your hand, wrist and arm into awkward pronated postures. The Rockstick 2 Mouse puts your hand is a neutral handshake position. 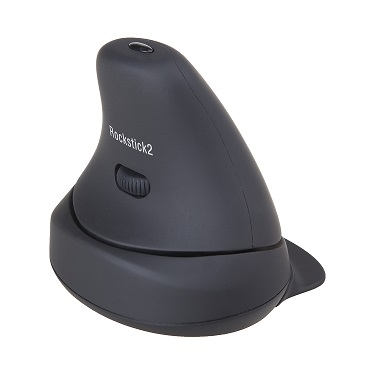 Eliminates Finger Clicking: The unique design of the Rockstick 2 Mouse allows users to click by utilizing the strength of the entire hand instead of fingers alone. The user simply rocks their hand to the right or to the left to active the right and left click features of a traditional mouse. Adjustable Pointer Precision:The Rockstick 2 Mouse offers 400,800, 1400, 2000 adjustable DPI precision. Pair-and-Play Wireless Technology: This mouse is ready to go right out of the box, simply plug the 2.4 GHz USB wireless receiver into an open USB port on your computer. Get ready to make the switch to vertical mousing bliss with the Rockstick 2 Mouse! Find yours today.